When I was younger, I used to attend a couple of air displays each year in pursuance of my lifelong interest in aviation. But it’s been six years since I went to a display – until today. My wife Vee and I spent the day at the Imperial War Museum Duxford in Cambridgeshire, partly to link up with some of her friends from the Czech Republic and partly to celebrate the 70th anniversary of the Battle of Britain. Vee’s friends – Zdenek Sadecky and Josef Vochyan – are from the Jihlava area of the Czech Republic and are members of the Czech Spitfire Club. Last year, Zdenek hosted a visit to Jhilava by Vee and her twin sister for a series of events to mark the 50th anniversary of their father’s death and, in a week’s time, they will be back there to attend events marking the 70th anniversary of the Battle of Britain. Vee and I have a particular personal interest in Second World War aviation because her Czech father Karel Kuttelwascher flew with the Royal Air Force in the Battle of Britain in 1940 and on night intruder operations in 1942 when he shot down 15 German bombers in three months. I researched and wrote his biography which was published in 1985. Among the many stalls at Duxford was one listing the names and displaying the photographs of the 88 Czechoslovak pilots who flew in the Battle of Britain including Vee’s father. Then the flying display by the Battle of Britain Memorial Flight featured a Hawker Hurrciane IIC painted in the colours of Kuttelwascher’s wartime aircraft. Flying Spitfires and (even more so) Hurricanes are scarce so long after the war, but today’s air display at Duxford included an exciting flypast by four Hurricanes and a thrilling flypast by no less than 16 Spitfires. 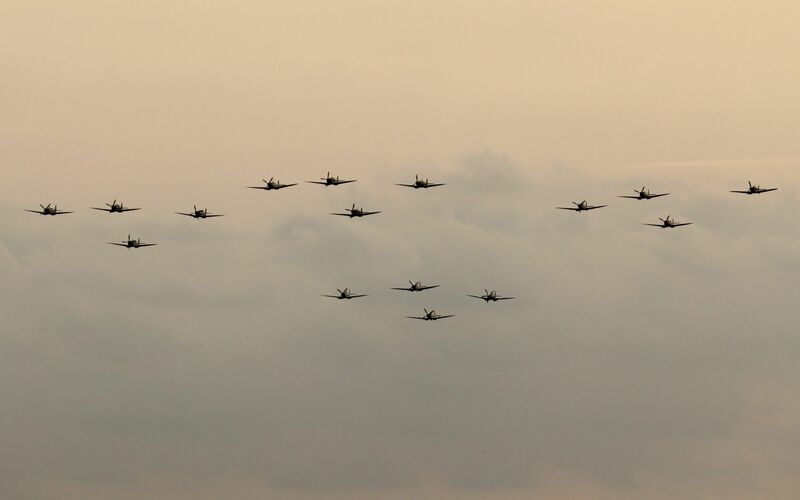 The sight and sound of these fighters was simply wonderful and a fitting remembrance to all the RAF pilots who defended Britain and prevented invasion in 1940. Footnote: You can see some film by JV of the flypast here. This entry was posted on Sunday, September 5th, 2010 at 10:37 pm and is filed under My life & thoughts. You can follow any responses to this entry through the RSS 2.0 feed. You can leave a response, or trackback from your own site.